This IMF working paper claims that the fossil fuel industry benefits from trillions of dollars of government subsidies every year. It is a working paper intended to "promote discussion" and not the official view of the IMF. Global fossil fuel subsidies of $5.3tr (£4tr; €4.6tr) annually amount to subsidies on suffering and must stop. Governments and taxpayers across the world continue to subsidise fossil fuels to the tune of trillions of dollars every year. Fossil fuel companies are benefiting from global subsidies of $5.3tn (£3.4tn) a year, equivalent to $10m a minute every day, according to a startling new estimate by the International Monetary Fund. Is the working paper's conclusion consistent with available evidence? Yes, the fossil-fuel industry benefits from subsidies equivalent to trillions of dollars, each year. Yes, the IMF's figures are broadly consistent with other studies: in particular, the cost of environmental damage from greenhouse gases alone, is of the order of trillions of dollars per year. These are costs which production incurs, but which are not borne directly by producers, and thus not reflected in the price. Environmental economics - for example within the IMF study quoted - treats these indirect subsidies as subsidies. it focuses on the broad notion of post-tax energy subsidies, which arise when consumer prices are below supply costs plus a tax to reflect environmental damage and an additional tax applied to all consumption goods to raise government revenues. It goes on further on pages 10-11 to define subsidy in more detail. post-tax consumer subsidies represent the amount by which the cost borne by the consumer falls short of the total economic cost of consumption. This excess cost (or subsidy) is either covered by governments in the form of budgetary support or foregone revenues or passed to the society in the form of environmental damage. This is consistent with how the term is generally used within the field of Environmental Economics. Fuel subsidies are different from subsidies in most other markets because of the substantial external costs of driving. The subsidy estimates capture both those that are explicitly recorded in the budget and those that are implicit and off budget ... Tax subsidies arise when energy taxation, which includes a corrective component for externalities and a component for revenue consideration, is below the efficient level. The efficient taxation of energy requires corrective taxes to capture negative environmental and other externalities owing to energy use. Subsidy in this report is defined according to the definition of World Trade Organisation's (WTO) Agreement on Countervailing Measures (ASCM) (Uruguay Round Agreements, 1994). This definition has been recommended to G-20 by the Global Subsidies Initiative (The Global Subsidies Initiative, 2010). The methodology for quantifying fuel subsidies in this study is the price gap approach. In the price gap approach, a cost recovery price for fuels is first estimated based on the world free on board (FOB) market prices. All additional monetary and non-monetary costs such as transport, storage, distribution costs, and corrective taxes to account for externalities are then added on top of the FOB price. This cost recovery price is then compared to the actual price. The gap between the two prices is the amount of subsidy per price unit. These pollution costs are included within the broader definition of subsidy as used by the IMF, because these negative production externalities are costs incurred by production, that the producer itself does not directly bear. Thus, those costs are not reflected in prices, leading to market failure and an unfair competitive advantage, of the same kind and market impact as if they'd received a cash subsidy on their directly-incurred costs. 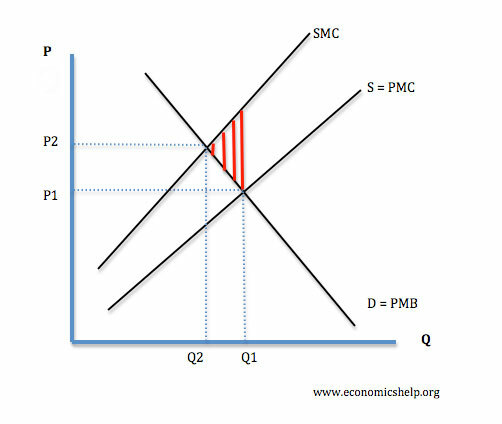 The deadweight loss from coal pollution is the red striped triangle: this comes about because coal producers do not have to pay for their pollution, leading to a competitive advantage, and an artificially high quantity sold Q1 at price P1. The International Energy Agency looked at 40 developing countries (rather than the IMF which looked at all countries), and found the consumer-side domestic price subsidies (which are only a fraction of total subsidies) to be USD 325bn in 2015. The year before, that figure had been USD 500 bn. Global carbon emissions from fossil fuel in 2007 were estimated by Lawrence-Berkeley Labs at 7988 MtC (megatonnes of Carbon) (=8365 minus 377 from cement). 7988 million tC/y x 3.67 tCO2/tC x USD106/tCO2 = USD3tn/y. 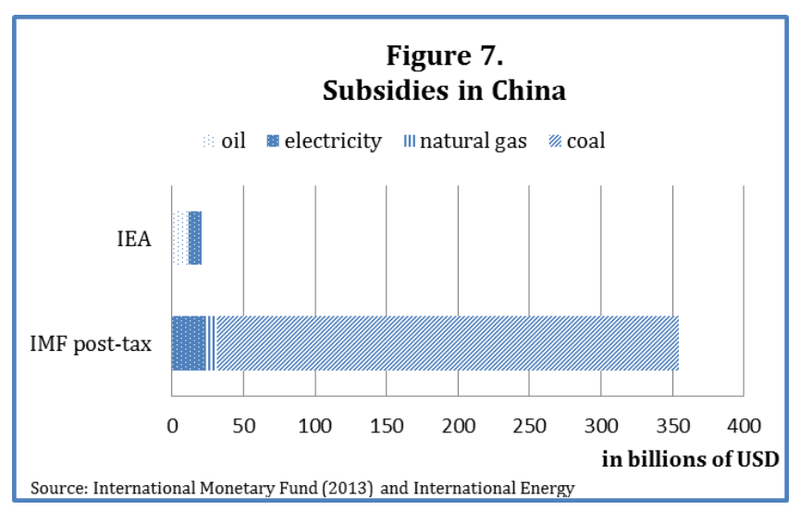 The IMF's definition of subsidy was the broadest, including the pollution damage costs, as well as covering all countries, and so is larger than simply the sum of producer- and consumer- subsidies for subset of countries plus some of the environmental impacts. So the IMF estimate of USD 5tn/y (all countries, all producer and consumer subsidies plus all environmental impact) is consistent with this. The size of the greenhouse-gas impacts alone is in the trillions. This means that the lobbyist's opinion-piece in Forbes is irrelevant to the claim in question: the aspects of the subsidy included, to which the lobbyist objects to, are tiny compared to the environmental impacts - which even they agree are valid. Among the references cited in that IMF paoer, I found the 2015 ECFIN brief "Measuring Fossil Fuel Subsidies" by Bárány and Grigonytė fairly illuminating in this matter. (To establish authority, ECFIN briefs "are occasional working papers by the European Commission’s Directorate-General for Economic and Financial Affairs which provide background to policy discussions".) Note to moderators: the source explicitly allows reproduction (hence the large quotes) as long as its origin is acknowledged. All bold/emphasis is mine, added for the TLDR people. The IMF approach is unique in the sense that it considers the inefficient taxation of fossil fuels as subsidisation. Thus the government's failure to deal with a market failure (such as the negative externalities associated with fossil fuel consumption) is itself a form of subsidisation according to the IMF. This approach is the most logical economically, as inefficient taxation (either not taxing fossil fuels enough to control for negative externalities, or taxing energy differently than other consumer products) is just a hidden subsidisation of fossil fuels. As the IMF concept of FFS is broader than that of the IEA or the OECD, the IMF estimates tend to be higher than the estimates of the other two organisations. The IEA estimates that FFSs in 2013 totalled USD 548 billion, or 5% of the total GDP of the 40 countries included in the analysis (IEA, 2014). The OECD estimates that in the 2005-2011 period an annual average of USD 55-90 billion was spent on fossil fuel (production and consumption) subsidies in its member states (OECD, 2013). This is much lower than the IEA's estimate, but understandably so: governments in developed countries don't set fossil fuel prices (as do some in developing countries), and use sophisticated methods to subsidise fossil fuel production and consumption to a much lesser extent than the countries included in the IEA's analysis. The IMF's estimate for global pre-tax subsidies in 2011 totalled USD 492 billion (or 0.7% of global GDP at the time), relatively close to the IEA's estimate of USD 523 billion for the same year (IEA, 2012). The IMF estimates that global post-tax subsidies amounted to USD 2.0 trillion in 2011, representing 2.9% of global GDP or approximately 8.5% of worldwide government revenue (Clements et al., 2013). Thus the value of the negative externalities associated with the use of fossils fuels is roughly three times as high as actual government support for fossil fuels. A key factor in estimating the magnitude of current subsidies is which definition of “subsidies” is used. [...] Post-tax energy subsidies are dramatically higher than previously estimated—$4.9 trillion (6.5 percent of global GDP) in 2013, and projected to reach $5.3 trillion (6.5 percent of global GDP) in 2015. Post-tax subsidies are large and pervasive in both advanced and developing economies and among oil-producing and non-oil-producing countries alike. But these subsidies are especially large (about 13–18 percent) relative to GDP in Emerging and Developing Asia, the Middle East, North Africa, and Pakistan (MENAP), and the Commonwealth of Independent States (CIS). Among different energy products, coal accounts for the biggest subsidies, given its high environmental damage and because (unlike for road fuels) no country imposes meaningful excises on its consumption. [...] These findings must be viewed with caution. Most important, there are many uncertainties and controversies involved in measuring environmental damages in different countries—our estimates are based on plausible—but debatable—assumptions. The International Energy Agency defines an energy subsidy as "any government action directed primarily at the energy sector that lowers the cost of energy production, raises the price received by energy producers or lowers the price paid by energy consumers" (IEA, 2014, p. 315). The price-gap approach is used by the IEA to estimate fossil fuel consumption subsidies for developing countries. This approach looks at the difference between a reference price and the price paid by end users. If this difference is positive, the particular fossil fuel is subsidised. The reference price is equal to the import parity price (the price of the fossil fuel at the nearest international hub, with transport and distribution costs and the VAT added) for fossil fuel importing countries, while it equals the export parity price (the price of the fossil fuel at the nearest international hub, minus transport and distribution costs and the VAT) for exporters. Many energy exporting countries and the Organisation of the Petroleum Exporting Countries (OPEC) disagree with this methodology. According to their view, the reference price for an energy exporting country should be the cost of production of the fossil fuel, and not the international market price (IEA et al., 2010). According to economic theory however, the legitimate reference price is equal to the export parity price for OPEC members, as these countries are making implicit losses (or not realizing implicit profits) on each barrel of oil that is not exported. The OECD defines a subsidy as "any measure that keeps prices for consumers below market levels, or for producers above market levels or that reduces costs for consumers or producers" (OECD, 2005, p.114). Even though this is in line with the IEA's definition, the OECD takes a different approach to estimate the extent of consumption and production subsidies together in its member states, using a "broad concept of support that encompasses direct budgetary transfers and tax expenditures that provide a benefit or preference for fossil-fuel production or consumption, either in absolute terms or relative to other activities or products." In other words, the OECD aims to measure all FFSs that are explicitly included in the general government budget. In its Inventory, the OECD analysed over 550 government measures that can be considered fossil fuel subsidisation. The 2010 Joint Report of the IEA, the OECD, and the World Bank distinguishes seven basic types of FFSs, based on the official type of government intervention. These seven types are as follows: (1) trade instruments such as tariffs; (2) regulations such as price controls that result in consumer prices being below market level; (3) tax breaks either for consumers or producers of fossil fuels; (4) credit to fossil fuel producers; (5) direct financial transfer either to reduce end user prices or to lower the costs of producers; (6) risk transfer such as loan guarantees; (7) energy-related services provided by the government at less than full cost. The International Monetary Fund (IMF) distinguishes producer and consumer subsidies to energy. "Consumer subsidies arise when the prices paid by consumers, including both firms (intermediate consumption) and households (final consumption), are below supply costs, including transport and distribution costs. Producer subsidies arise when prices are above this level"(Clements et al., 2013, p.5). The benchmark price is the international market price - adjusted for transportation and distribution costs - for internationally traded products - while it equals the cost-recovery price for energy products that are not internationally traded. The IMF further distinguishes pre-tax subsidies and tax subsidies for fossil fuel consumption. Pre-tax subsidies are defined in a similar way to the IEA's approach to subsidies, i.e. the difference between the oppor-tunity cost of supplying a consumer with fossil fuel (the international market price) and the price paid by the end user. The tax subsidy is the difference between the efficient level and the actual level of taxation for a given fossil fuel. The efficient level of taxation means first that the tax controls for the externalities associated with the use of the fossil fuel such as pollution and its effects on health, environmental costs, congestion, all of which reduce over-all welfare but are not taken into account by the user of the fossil fuel. This approach has a direct consequence for assessing post-tax subsidies for coal which is the most polluting fossil fuel, hence the negative externalities associated with the use of coal are by far the largest. Second, efficient taxation implies that fossil fuels are taxed the same way as other consumer products. Intuitively, the sum of pre-tax and tax subsidies is equal to the overall subsidy to the par-ticular fossil fuel, called the post-tax subsidy. While pre-tax subsi-dies have mostly been phased out in the developed world, they are still common in developing countries. Tax subsidies are prevalent in both developed countries and emerging economies. While the IMF provides the most comprehensive source of data for FFSs; some estimates are still missing from the study, as subsidies are not estimated for each country or for each fossil fuel. Petroleum subsidies are estimated most thoroughly for all 176 countries included in the analysis, using the price-gap approach, with production subsidies included for some OECD countries. Natural gas and coal subsidies are estimated for only 56 countries (with production subsidies to coal included for some OECD countries). Subsidies to electricity are estimated for 77 countries using multiple approaches and multiple data sources. In general, taxing negative externalities (as the IMF paper implicitly proposes) is called a Pigovian tax (a term found in the IMF paper itself). And the Forbes piece is a good hint that a certain part of the political-economic spectrum (like Hayek and so forth) don't dig that. In contrast others like Stiglitz have asked for a tax of $50-$100 per cabon tonne, approximately 10 to 20 times higher than in the current EU system. In a 2006 survey of Ph.D. members of the American Economic Association, 65.0 percent agreed that ‘‘the US should increase energy taxes’’ [Whaples 2006]. Similarly, the Wall Street Journal asked business economists in 2007, ‘‘What is the most economically sound way for the government to encourage development of alternatives to fossil fuels?’’ The poll found 54 percent advocating ‘‘taxes that raise the cost of purchasing fossil fuels’’ [Izzo 2007]. There are also much more recent surverys of the US public (rather than just economists) showing support for a carbon tax. Also for quite a number of purposes (in federal regulatios) a Pigovian carbon tax already exists in the US as the "Social Cost of Carbon", and it has withstood a challenge in a federal court as non-arbitrary. However the battle between the Obama-era regulations/legislation and the Trump administration's reinterpretation thereof continues, this time in quantitative terms, from $45/ton (by 2020) of the Obama-era to $1-$6/ton in Trump administration's view. The large difference comes from whether the SCC should include world-wide effects of US emission or just effects in the US, as well as from a time-discounting issue. The fresh research shows that Britain has climbed from a 2012 ranking of 20th out of 33 industrialised countries to 7th on the low-carbon electricity league table. “Britain is reducing its carbon emissions from electricity faster than any other major country, and this has happened because the carbon price and lower gas prices have forced coal off the system – the amount of coal-fired power generation in Britain has fallen 80pc between 2012 and 2016,” said Dr Iain Staffell, from Imperial College London. While coal generation has fallen in the UK, Dutch coal-[f]ired power plants have ramped up due to sluggish European carbon price, causing emissions in the Netherlands to rise by 40pc between 2012 to 2016. And no, you won't get my own opinion on who is right. Not the answer you're looking for? Browse other questions tagged economics government fossil-fuel . Does using ethanol fuel save money, and is it better for the environment? Does every act of piracy impact revenue by the current content price? Does the time of day affect fuel economy? Does Texas have the right to secede from the United States? Does pumping gas when the tank is half full and on the low flow setting provide an economic benefit? Does the meat industry cause 414 billion dollars in externalized costs? Does it take the average US worker in 2015 just 17 weeks of work a year to earn the average living standard of 1915? Does the UK subsidise fossil fuels more than other European countries?